Between our smartphones, cameras and computers, we’re downloading and creating more content than ever. Which makes storing, managing and accessing that content a real challenge, especially if you have a family of content creators, like I do. That’s where the new WD My Cloud Home can help. It’s a simple-to-use content management solution for your entire family’s collection of photos, videos and more. At the My Cloud Home’s core is a massive storage device, available from 2TB all the way up to a 16TB dual drive. But it’s the software and app, focused on bringing together content from all your devices (and even social media and cloud storage accounts) and making it easily accessible for sharing and streaming, that really transform it. Setting up the drive is as simple as connecting it to your router via the included Ethernet cable and plugging in the power. Once you have it up and going, download the My Cloud app (available for Android and iOS) and in just a few steps you’ll have it connected to your drive via your home’s Wi-Fi network. The whole process took me less than 10 minutes. Now the fun begins. 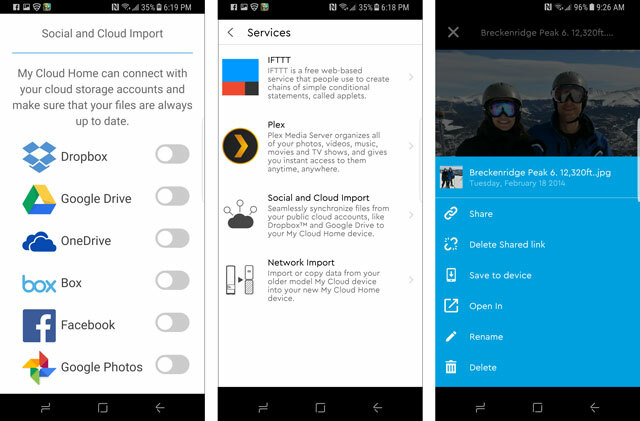 You can set the My Cloud Home to backup photos and videos from your phone, pull in all your Facebook pics and videos, and import content from Dropbox, Google Drive, One Drive, Box and Google Photos. One nice bonus with the Facebook integration is that it will pull in commentary related to your photos and videos, which makes your memories more vivid while also making it easier to find content later, without a laborious manual tagging process (assuming you mentioned the person in your post) – a search for my son, “Zach”, in the My Cloud app quickly shows me the dozens of photos and videos of him I’ve shared to Facebook over the years. If you’re comfortable using IFTTT, then you can create rules to automatically save new Gmail attachments, Instagram photos and much more. And the My Cloud Home has Plex integration, so videos, movies or TV shows you have on Plex become part of your My Cloud Home library. If you have more than one family member using My Cloud, each will be able to set up their own account and separate content area. Once you have your content loaded into the drive, you can start accessing it from anywhere through the app or your web browser. In fact, I’m reviewing my photos as I write this article at 30,000 feet on a flight from New York to Chicago. The app also makes it easy to share my photos or videos with family and friends via messaging, email, social or any other sharing app on your device, and will create SMS-optimized thumbnails that open to full-sized images when clicked to save bandwidth. Western Digital knows that video streaming is a big part of how we use our content, so has created features to optimize streaming performance and bandwidth, as well. The My Cloud app will automatically adjust the video resolution based on the device you are watching on – high-resolution displays will get high-resolution video, and vice versa. The My Cloud Home is available exclusively through Best Buy in either a single-drive My Cloud Home or the dual drive My Cloud Home Duo. The My Cloud Home is $159.99 for a 2TB drive $179.99 for 3TB, $199.99 for 4TB, $259.99 for 6TB and $319.99 for 8TB. 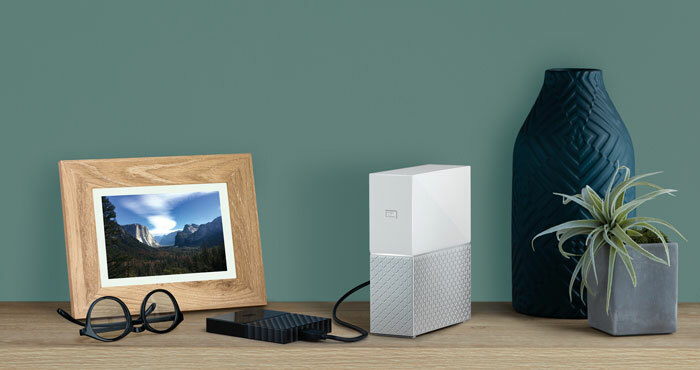 The My Cloud Home Duo is $309 for a 4TB, $399.99 for 8TB, $549.99 for 12TB, and $699.99 for 16TB.